We offer reconditioned compact fiber coupled CCD spectrometers. These spectrometers are crossed Czerny-Turner design, built by B&W Tek (Model BTC-110S). These are OEM instruments formerly used in a medical device. 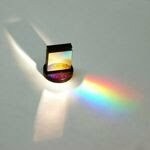 Our spectrometers are available through eBay, or can be purchased directly from us using PayPal. Please contact us at info@science-surplus.com for information. We install a new grating, re-align the optics, and place the OEM unit in a new custom enclosure as shown in the photo. We also install a basic order sorting filter to reduce stray light from higher diffraction orders. A fiber optic collection cable (SMA) is included. The unit operates on 5 volts DC, and a power supply is included. Spectra are read out through serial port communication (D9 communication cable included). The enclosure, power supply, SMA cable, communications cable and software are all included in a kit. For the DIY optics specialist we offer the hardware in "pre-aligned" condition, meaning that we have done a rough alignment to make sure the spectrometer is functioning and detecting light properly, but have not finalized the alignment for optimum resolution. A pre-aligned spectrometer still needs to be wavelength calibrated, but is often suitable for use in many applications without additional alignment. We provide instructions for carrying out the final alignment procedure if the pre-aligned resolution is insufficient. We a currently unable to offer fully aligned and calibrated spectrometers. DIY kits cost $200. We often have these kits available through ebay, or you can contact us for availability. DIY kits come with an 1800 l/mm grating. We can provide a different grating for an additional charge of $100, but many people choose to purchase their own replacement gratings directly from a grating reseller (Thorlabs, Edmund Optics, Optometrics etc.). The spectrometers can be configured for different wavelength ranges and different spectral resolutions. If your spectral range is not listed below, please contact us. The resolution listed is for a fully aligned unit, and DIY kits will need final alignment to achieve these resolutions. The grating in the default spectrometer is not sensitive to UV much below 300 nm. These spectrometers are slower than state-of-the-art units on the market. They require an external 5V dc power supply (included with purchase). These spectrometers come complete with Spectrum Studio, a software package written by Science-Surplus.com. It works with all modern versions of windows (XP or later). It uses the Windows .NET framework 3.5, which is standard on all current Windows machines. The software help file includes instructions for building your own custom software interface. Spectrum Studio includes a line identification utility. 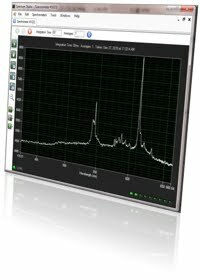 Using wavelengths compiled and critically evaluated by scientists at the National Institute of Standards and Technology, this utility lets you identify spectral lines with the click of a mouse. You can add molecular lines or other spectral features to the database using the simple step-by-step instructions in Spectrum-Studio's help file. The spectrometers use serial communication. Your computer will need either a 9-pin com port OR a usb-to-serial adapter. If you have multiple ports, you can run multiple spectrometers simultaneously!